Deliver happiness by sending this Lovable and Passionate Gifts Hamper to make others happy. 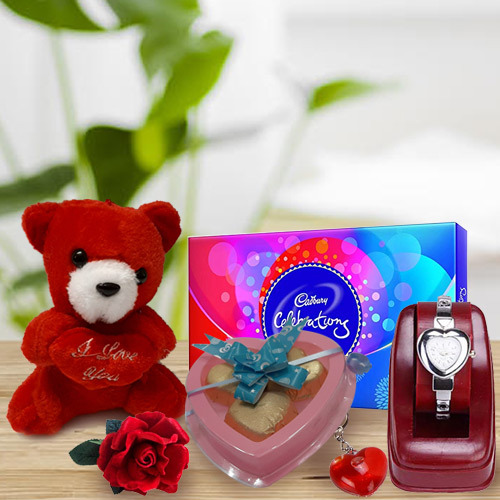 This special type of Combo is featured with 1 Cadbury Celebration (Big), a Singing Teddy, 1Pc Velvet Rose, a Heart Shaped Key Ring, a Heart Shaped Watch and 3Pcs Heart Shaped Chocolates. Flowers Delivery Bhuj, Send sweets Gorakhpur, Wedding Cake Nagaur, Diwali Mithai Cochin, Send Flowers and Gifts to Nakoda, Online Shop Patna, Flower to Calcutta, New Year Flowers Margao , Fresh Fruits Tirunlveli, Send Gift Phagwara, Dry Fruits to Bhiwadi, Birthday Delivery Kumbakonam, Sending to Pali, Flower shop Calcutta, Thrissur Online Cake Delivery.